Disclosure: This meal and drinks were kindly given free of charge in return for an honest review of the Prince of Wales. This does not affect my judgement in any way. Last week I was kindly invited to visit the Prince of Wales on Ecclesall Road, Sheffield to sample their new menu and be one of the first to see their brand new refurbished interior. Kev and I usually have a nice meal out once a month so this was perfect timing for our January outing and it went a little way to making this stupidly long month semi-bearable. Having never been to the Prince of Wales before, I had no idea what to expect; I could only go on what I'd read online but first of all I was pleased to read that there was ample parking space because I know what a nightmare areas like Ecclesall road can be for decent parking arrangements to that put my mind at ease before we set off. We didn't hang around for too long outside because true to British weather, it's been absolutely freezing but I did notice their outside seating areas which look absolutely perfect for summertime so it'd be somewhere I'd return to in summer, if not before! 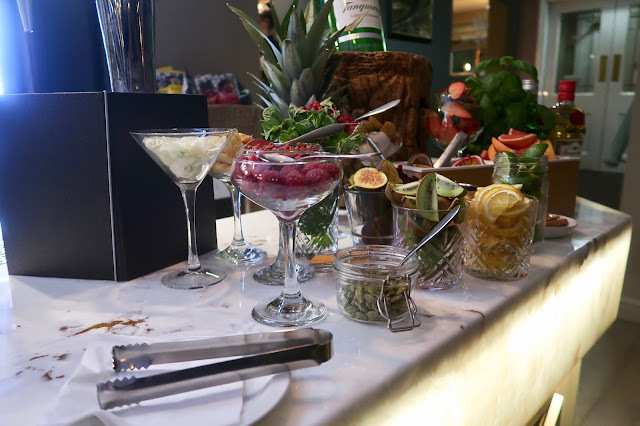 "a contemporary and welcoming bar, restaurant and pub that provides a fantastic setting to socialise, dine, and relax with your nearest and dearest. Step inside and you’ll find roaring log fires, a unique dining space, and modern interiors. There’s even a lovely garden patio that provides a wonderful setting to dine and relax on a sunny day." 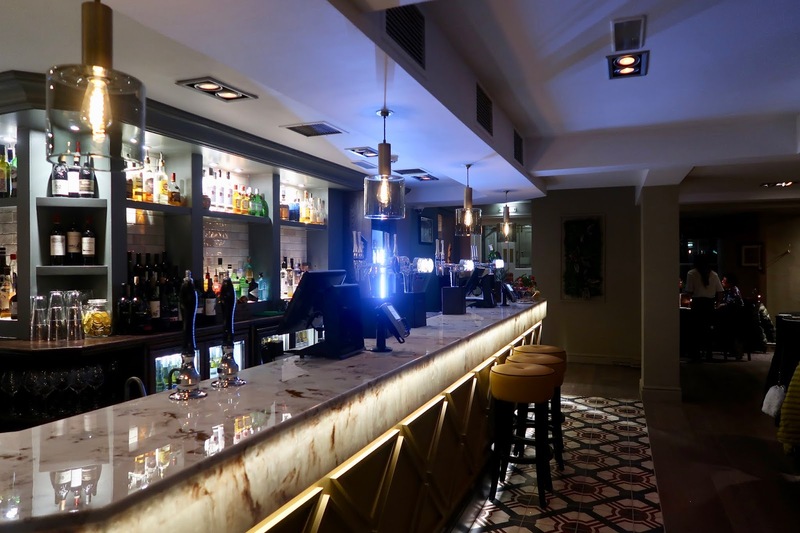 The new bar top is absolutely beautiful; in fact it was the first thing that caught my eye and I made a point of commenting on it; it's like a marble finish with gold flecks; it's stunning. 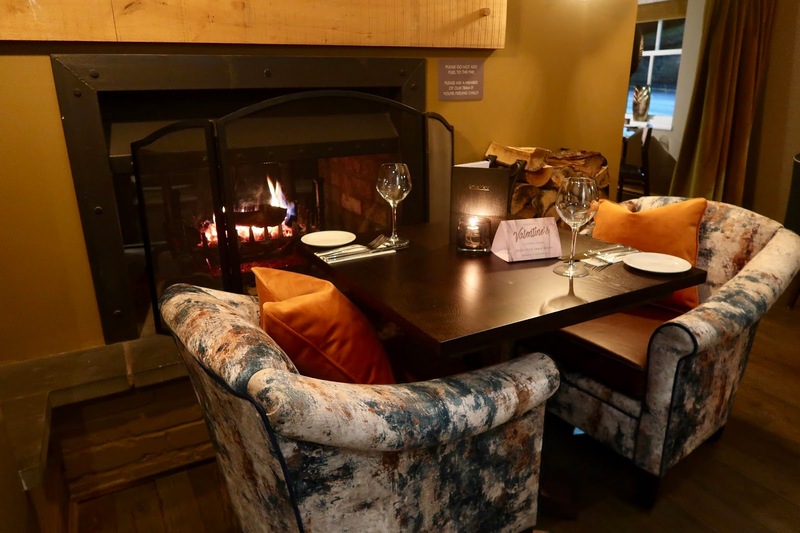 The seating arrangements are perfect; there are more relaxed areas arm chairs in front of log fires and round tables with plenty of bench and chaired seating around as well as more formal dining areas with more traditional set ups. 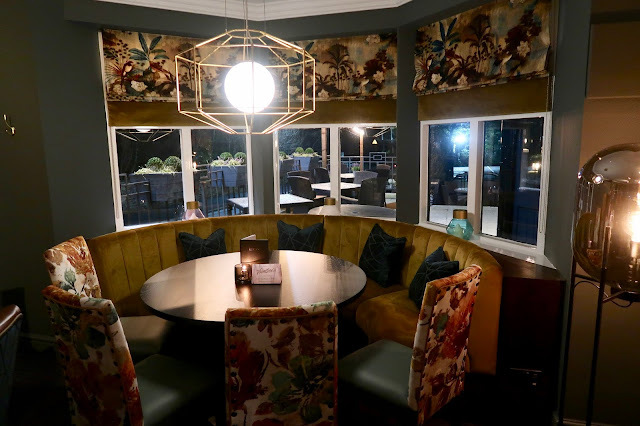 As you can see the furniture choices are absolutely on-point with floral and studded details to give the Prince of Wales that perfect balance between fine dining restaurant and traditional British pub. As you will see on the photos, the lighting in the restaurant areas is quite dim which makes photography just that little bit more difficult and would probably make seeing the menu difficult for some but I actually love that kind of lighting because it just makes for a relaxed and cosy ambiance. Now onto arguably the most important part; the food. We were greeted with a choice of drinks; I chose one of the gins from their selection and was pointed in the direction of the gin bar which had various additions that I could make to my gin; I went for the Chase Oak Aged Sloe and Mulberry G&T served in a balloon glass (if it's not in a balloon glass, are you even drinking gin?!) which was a really, really good choice and I added raspberry and strawberry which made it perfect. See the full drinks menu here. We were then treated to a selection of bits to try off the menu to give us a taste of what was to come and at this point it was a little bit make or break because if this wasn't any good then it didn't set a very good precedent for what was to come - luckily everything was really tasty; we had samples of Lobster and King Prawn Pot, Chargrilled Lamb Kofte, Pork Belly and a selection of other items from the menu. Each one was delicious - so much so that my main meal choice came from one of the sample bits! 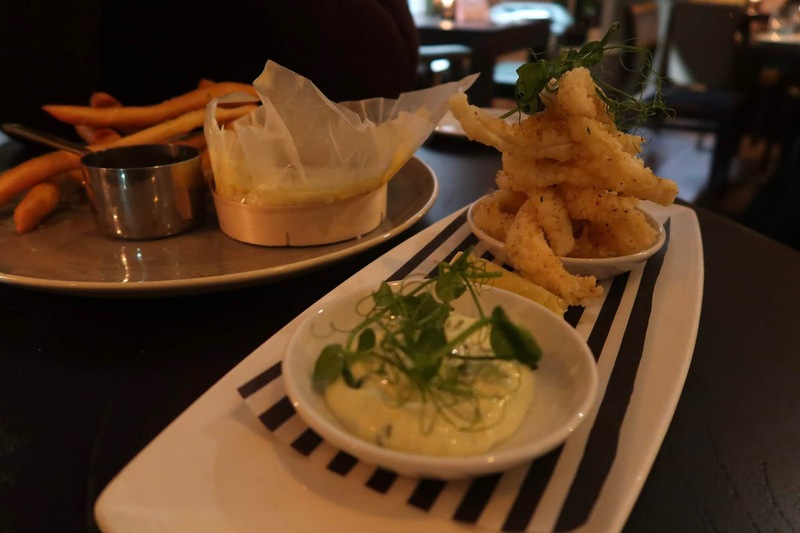 The squid wasn't as good as I imagined it was going to be; the salt and szechuan pepper didn't really come through for me and the batter was a little thick for the squid in my opinion - it was by no means horrible but it wasn't what I expected. I think the thickness of the batter was what stopped them from being as crispy as they could have been. Nevertheless, there was plenty of it and the aioli was the perfect dipping sauce. Onto the main event; Kev picked the Wagyu burger because time and time again we've heard that this 'Wagyu' steak is supposed to be the best you can get so it this was the obvious choice from the menu because in my opinion if a pub/restaurant can cook a decent burger you know it's a goer. The burger itself looked very impressive on arrival - stacked high with cheese, salad, pickles and relish with a generous side of sweet potato fries and onion rings. The fact that this comes with sweet potato fries as standard is a huge bonus for Kev - he would usually go for them but more often than not there's an extra charge for them. 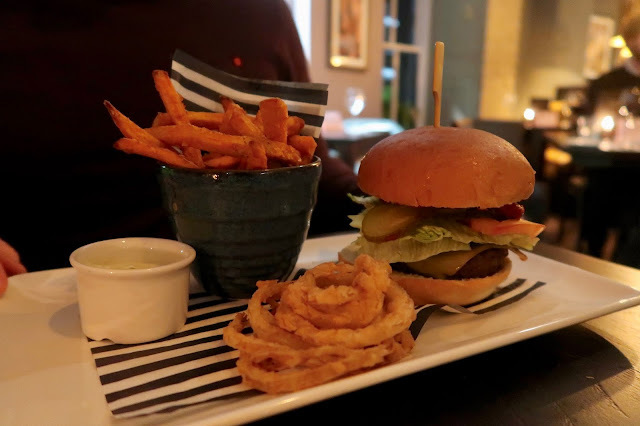 The fries and onion rings were cooked perfectly - crisp but not fried within an inch of their lives and the burger was cooked well - although possibly a little too well done for me. If I'm having a steak burger I expect it to be cooked medium. However, my opinion aside - Kev said he really enjoyed it and would definitely recommend it. I went for pork belly which was obviously what I'd tasted a little bit of on the initial sampling plate. I have to admit that I am a little bit funny about pork belly and wouldn't normally go for it because if it's too fatty it puts me off (I know pork belly, by nature, is fatty but there is a fine line). But I'm soo glad I did because everything was absolutely delicious and although the portion size doesn't look huge it was definitely filling and I really did enjoy every mouthful; even down to the green beans - cooked el dente with a gorgeous buttery taste. The pork itself was cooked to perfection with a stick of crackling to go with it (which was also perfect crunchy crackling!). 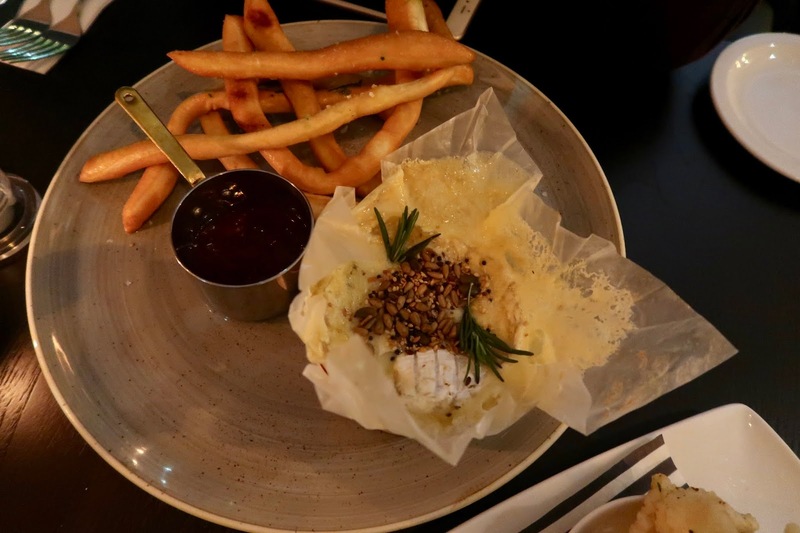 Kev was particularly impressed with the potato dauphinoise - it was a great alternative to the potatoes you usually get with a meal and I would 100% recommend this main meal because I can't tell you how nice it was. My only concern really was that I didn't finish off the potatoes purely because I wanted to leave room to enjoy a pudding! Between main course and pudding I opted for an aperitif cocktail (that makes it sound like I knew exactly what I was doing when I ordered it - I didn't, I just liked the sound of a cocktail that incorporated candyfloss). The Candyfloss Martini contains Sailor Jerry spiced rum with ginger and lime served over a fluff of candyfloss. I'm all for a bit of cocktail theatrics so the fact that this was served in a separate little milk-style bottle for me to pour myself pleased me no end. This was a strong cocktail and absolutely not for anyone who prefers fruity numbers but I'm convinced that it did aid my digestion ready for dessert (it probably didn't, but that's my story and I'm sticking to it...). 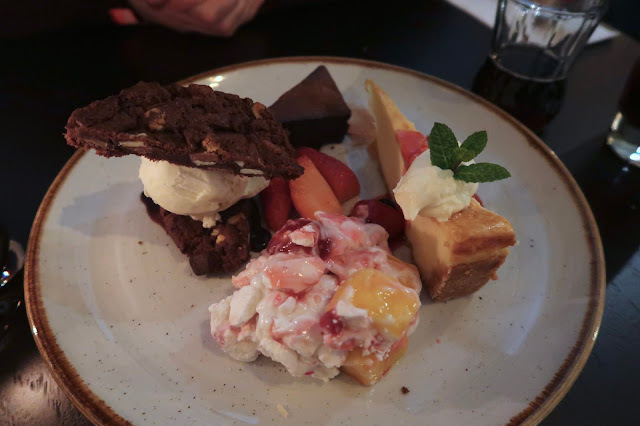 Kev and I are creatures of habit in a lot of senses and we definitely are when it comes to puddings; we will always order a sharer if available or we order one each and just put them in the middle of the table. 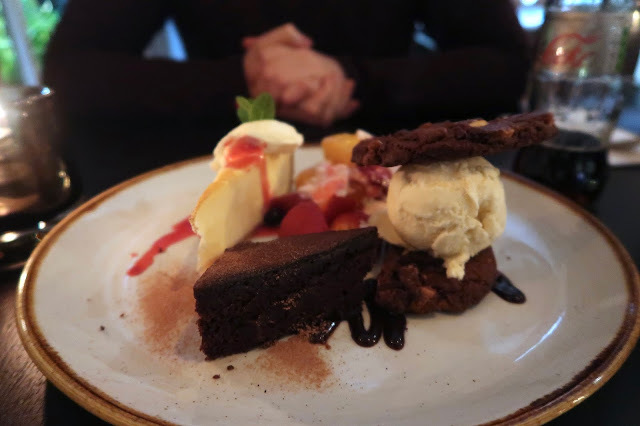 The Prince of Wales have a House Sharer which was the obvious choice for us and it came with chocolate brownie, baked vanilla cheesecake, mango and berry meringue mess and a bourbon vanilla ice cream cookie sandwich. What I love about sharers is that you generally get a mixture of fruity and chocolatey desserts so this one didn't disappoint in that sense and the portion size was also very impressive because usually sharing desserts have relatively tiny little bits of a few desserts but this was a full slice of cheesecake along with good sized portions of all the other desserts. This ended up working really well for us because rather than fighting over the same favourite we ended up preferring different parts (although having said that, I feel that Kev had more than his fair share of the mango and berry meringue mess, but I don't like to say anything because obviously I'm a very polite girlfriend...): Kev's favourite was the baked cheesecake which was a little bit plain for my liking but the texture was perfect; my favourite was the brownie which Kev thought was more like a sponge cake than a fudgey brownie but it was chocolate so it won my vote nonetheless. We both agreed that the ice cream cookie sandwich was a winner for both of us as it was everything we wanted in a cookie - crunchy on the outside and soft on the inside. We both finished our meals feeling very full but also very impressed with the service and quality of food we had received. 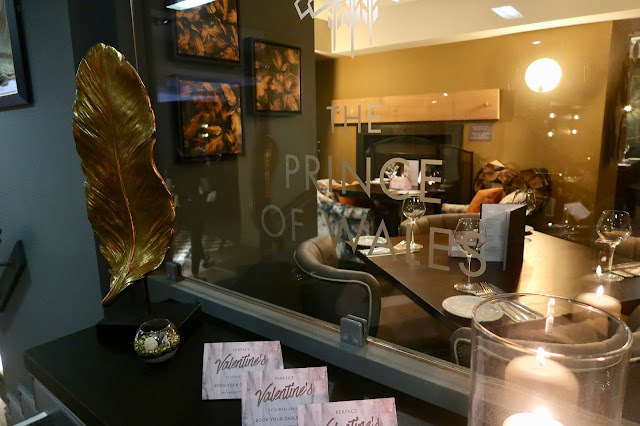 The staff we came across were very attentive and friendly and we would both wholeheartedly recommend the Prince of Wales for a special meal. It can seem quite pricey but for the standard of food you're getting I can definitely say that it is value for money. 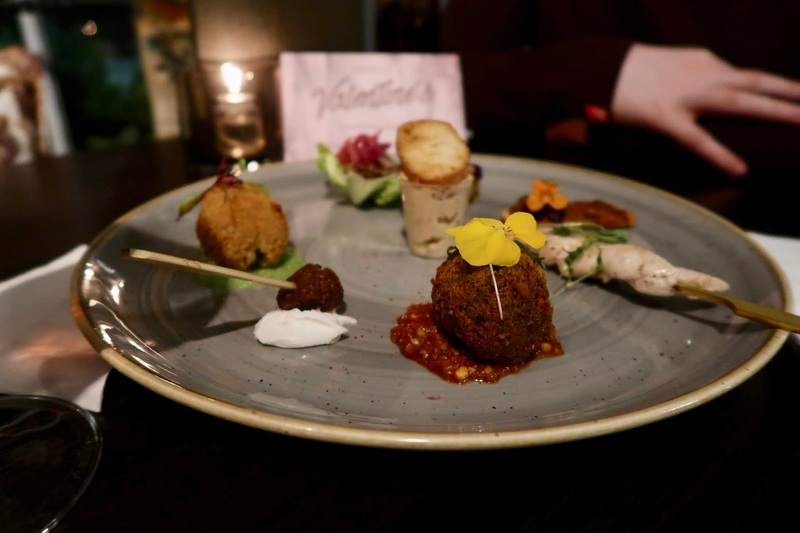 You can view all the menus online including their lunch menu, dinner menu and Sunday menu as well as their all new vegan menu which should excite those of you who are vegan and often struggle for somewhere nice to eat that has a variety of menu choices. Valentines day is coming up so if you're in the Sheffield area looking for somewhere nice to take your other half and they have a set menu from £26 per person; click here to view the Valentines Menu and book your table. You'll definitely see me at the Prince of Wales again; does it sound like your cup of tea?